More than a half-century after he finished the requirements to earn the rank, an 88-year-old man was honored as an Eagle Scout, making him possibly the oldest person to ever collect the Boy Scout honor. Walter Hart could not become an Eagle Scout at the time he earned the rank because his service in World War II got in the way. "I've been looking forward to this for a long time," Hart, who lives in a retirement center in nearby Lehigh Acres, said Saturday. Scout officials say he may be the oldest person to ever earn the honor. 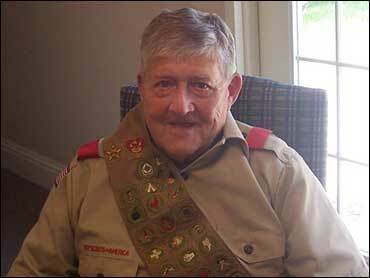 Hart joined the Cub Scouts in 1928 and earned 23 merit badges during his years as a Boy Scout, scouting officials said. Of the 120 merit badges available, 21 must be earned to qualify for Eagle Scout rank. It all got set aside when he joined the Navy during World War II and served two years aboard the USS Alfred A. Cunningham. Last year, he rediscovered some of his old Boy Scout memorabilia, including documents that showed he completed the requirements for his Eagle Scout rank. He contacted the Scouts about receiving his award. "I think this was something that was always on his mind, but every time he went to go do it, something else came up," daughter Elizabeth Gatturna said. "I know how hard he's tried to get to this point." Only about 5 percent of all Boy Scouts earn the rank of Eagle Scout. Since 1912, nearly 1.9 million Eagles have been awarded, but the recipients' ages aren't recorded, Boy Scout officials said. "I'd be pretty surprised if anyone older has ever become an Eagle Scout," said Margie Byers, spokeswoman for the Southwest Florida Council, Boy Scouts of America.